Marvel-ous nesting dolls! Earth's mightiest founding heroes are now nesting dolls! Formed in 1963, Marvel's Founding Avengers are now a great set of incredible wood nesting dolls. 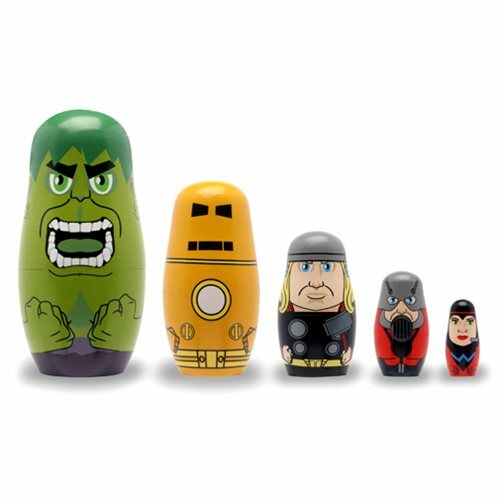 These 1 1/2 to 5 1/2-inch tall Avengers Founding Avengers Nesting Doll Set include The Hulk, Iron Man, Thor, Ant-Man, and The Wasp in the center. This Founding Avengers Nesting Doll Set is a must-have for all Avengers and Marvel fans alike! Ages 8 and up.